Welcome to the EEB Alumni News Blog! Are you curious about what your fellow EEB alumni have been up to since graduation? Are you looking to connect with alumni working in certain industries? Do you have a personal or professional update you’d like to “share with the whole class”? If so, this blog is for you! We hope you enjoy exploring. As always, let us know if there is anything the department can do to support you as an alum! 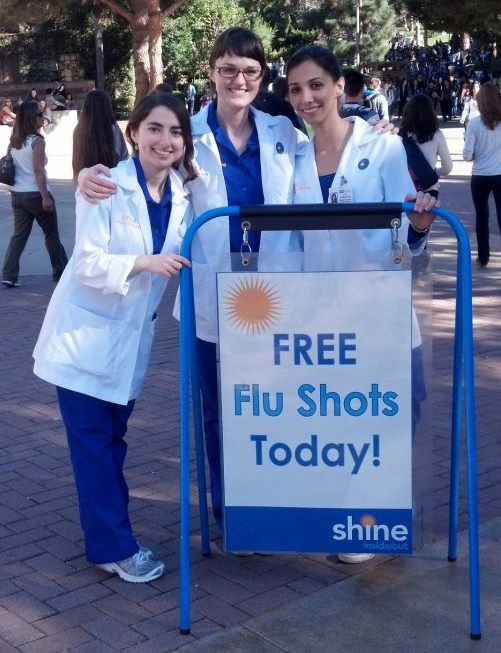 Kate Groundwater ’10 (middle in photo) is currently pursuing her MSN in the UCLA School of Nursing’s Masters Entry Clinical Nursing program. Before beginning her studies, Kate worked as an intern and later a Medical Assistant for Planned Parenthood. Julia Barske ’13 graduated with a PhD in Biology. She has recently written a paper titled “Energetics of the acrobatic courtship in male golden-collared manakins (Manacus vitellinus)” in Proceedings of the Royal Society B December 18th. Brian Teng ’12 graduated with a BS in Ecology, Behavior and Evolution. He has just started a new job at the University of San Diego. He is the Project Assistant for a 5-year NSF-funded research project on climate change education for key influentials. His responsibilities include website design and maintenance, social media strategy, event planning, and administrative activities. More on the project is available here (http://www.sandiego.edu/climate/). Leslie Grant ’12 graduated from UCLA with a Biology degree. She is currently finishing up her second year in Teach for America, where she works in an Alliance charter school in Downtown Los Angeles. She currently teaches a 10th grade Anatomy & Physiology course at this school. The most recent project they have done was a dissection of rats and fetal pigs, which was funded through Donor’s Choose. 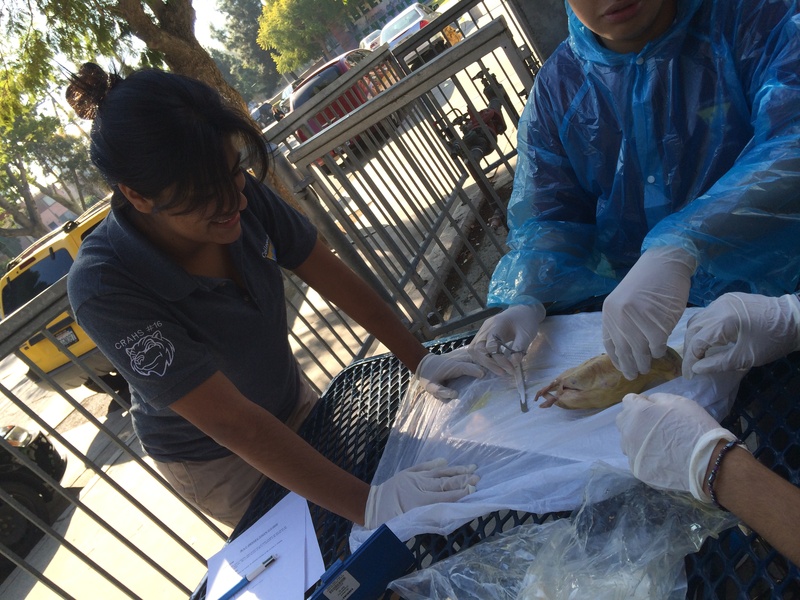 Attached is an image of the students engaging in the dissection. Daniel Lieu ’10 graduated with a BS in Biology. He graduated from pharmacy school at the University of the Pacific in 2013, and is now living and working in San Diego. He worked with Dr. Blumstein and Dr. Fong, along with JP Drury, on the FMBQ (2009) and was published for the project we conducted together. He was also selected as 1 of 26 LGBTQ scholars to receive the Point Foundation Scholarship in 2013. Christelle Follette ’10 graduated with a BS in Marine Biology. She is currently pursuing her Doctorate of Veterinary Medicine at Ross University School of Veterinary Medicine. She is just finishing my first semester. Patrick Green ’09 graduated with a BS in Ecology, Behavior, and Evolution. After some time spent teaching outdoor education, he returned to work in EEB as a field assistant for Dr. Greg Grether, a research assistant for Dr. Blaire Van Valkenburgh, and a TA in the department. He began a PhD program in Organismic and Evolutionary Biology at the University of Massachusetts, Amherst, in 2011, and this year he moved (with my PhD advisor, Dr. Sheila Patek) to Duke University. He is now in my 3rd year, researching the interaction of functional morphology and animal behavior in mantis shrimp (Stomatopoda).